Tim Grierson and Will Leitch will be writing regularly on Gawker and Deadspin about movies, starting this week. Yesterday and today, to wrap up the week, we're showering love on our favorite films that are up for Best Picture. Yesterday, Tim Grierson took up the case of The Descendants. Today: Will Leitch argues why you should be cheering for Midnight in Paris. 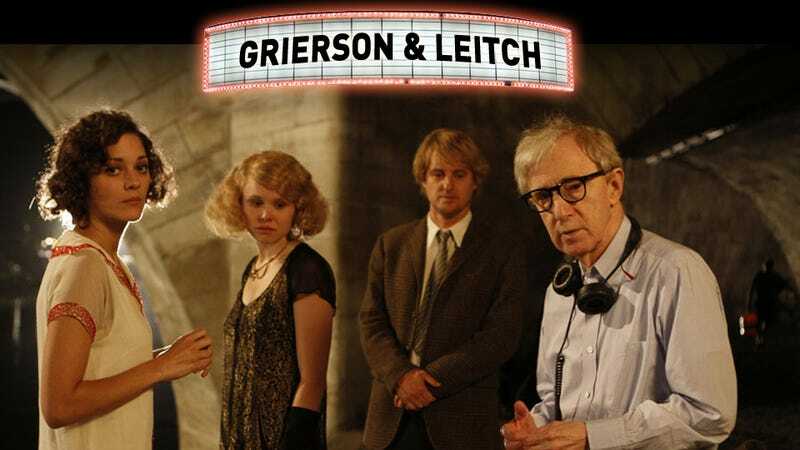 Follow Grierson & Leitch on Twitter for more business. It has become fashionable, in recent years, to proclaim that our obsession with nostalgia—or "retro," as we call it now—is cannibalizing our popular culture. No one creates anything anymore, the complaint goes, and we're all just a self-referential echo-chamber circle-jerk of people collectively trying to one-up each other with "hey, remember that cheesy commercial?" references. It's easy to understand. The highest-grossing music tours are all past-their-prime rock bands. Reality shows feature more has-beens now than never-weres. The tentpole movies are all sequels, remakes and reboots. Freaking Jaleel White is a thing again. But this generation is like the generation before it and the generation before that one: Everyone thinks things used to be better back in the good ol' days. Sure, we wrap it in a more ironic package now, less your dad mumbling that "the world's going to hell" at the breakfast table and more "OMG Buzzfeed Must Click Princess Bride-Breaking Bad mashup!" But it's the same thing. It's the idea that there was a time, not now, when everything was better, when everything meant more than it did now, when life and culture were sufficient. And that time when everything was great ... we missed it, and we can't get it back. Your grandparents thought it, your parents thought it, and now you do, too. So, leave it to Woody Allen, a man who has been obsessively nostalgic for the past for about 50 years now, to finally get this right. In a year in which the three most critically beloved movies were The Artist (about repackaging and reliving the past), Hugo (about recapturing a magic of cinema that has presumably been lost), and The Tree of Life (a middle-aged director musing on the purity of his childhood and the eternity of death), it took Woody freaking Allen, of all people, to nail down the essential truth of nostalgia: We fetishize the past because we're stuck living in the present. As Owen Wilson's Gil puts it: "That's what the present is. It's a little unsatisfying because life is unsatisfying." Gil, listless with his engagement and his life, wanders around Paris the way every young idealist has roamed around Paris, as if it's impossible to imagine how anything beautiful and lasting and poetic could be created anywhere other than there. It's only natural, then, that in his fantasies, he travels to the past and hangs out with writers living the life that surely inspired him to become a writer in the first place, before real life messily shoved itself in the way. It's Hemingway! It's the Fitzgeralds! It's Gertrude Stein! These are the people who, Gil believes, lived the perfect life, but your mileage may vary. Maybe you think things were better on Mad Men. Maybe you miss grunge. The point is that Gil is happy here. The point is that this is the only place Gil is happy. But then, as Gil spends more time in the past, he realizes something: No one there is happy either. When he meets Adriana, played by Marion Cotilliard, he instantly recognizes a fellow dreamer who doesn't quite belong but desperately wants to. He discovers that his perfect past is her depressing, inescapable present: She wants to live in the Paris of the 1880s, with Toulouse-Lautrec and Gauguin and Degas. But no one there is happy either. Everyone wants to be somewhere else. Everyone wishes have been from a different time because everyone feels vaguely unfulfilled in the present time because that's what life is. Gil's triumph is that he recognizes this and, in the end, decides that the only way he can have a different life is to start a new one. It's a muted triumph, like all triumphs in Woody Allen movies, but compared with some of his other films' morose, trapped protagonists, this is the Woody Allen equivalent of hitting the last-second shot to win the big game in a sports movie. This wouldn't even matter all that much if Woody hadn't wrapped this "minor, but important" point about nostalgia—his words, not mine—in such a shiny, deeply pleasing package. I don't remember the last time Woody seemed so eager to entertain, when he seemed so light on his feet; even as an admirer of many of the recent films his detractors love to complain about, it's undeniable that he's having more fun in Midnight in Paris than he's had a long time. Part of it might be Owen Wilson, whose dazed smart-Keanu is a perfect counterbalance to Woody's hyper-aware sullenness. (It's a surprise that so few people talk about how good Wilson is in this.) But mostly: You sense that Woody—cocooned in the Upper East Side apartment that has sealed him off from the world for several decades—understood the relevance of the point he was trying to make, and that he wanted to deliver it in the most attractive package possible. For a wistful film about loss and sad realization, Midnight in Paris is awfully sunny, and consistently hilarious. He brought out his A-game for this one, and audiences, delightfully, at last responded. In retrospect, it is not a surprise this turned out to be Woody's highest-grossing film of all time. It is as universal as any he's made in 20 years. And at the end of it all, there is Paris. Some have criticized the film for focusing on the more touristy aspects of Paris, an American's version of what the City of Light means, rather than what it is actually is. For that, of course: Thank heavens. Paris is an eternal city where everything is exactly the same as it was 100 years ago and of course dramatically different, where you can escape to a different place and time without leaving the spot where you stand.